I’ve had three pregnancies that had me so sick I was hospitalized all three times. It played havoc on my teeth. I’ve spent a fortune and haven’t even scratched the surface. I’ve gotten to the point where I’m only going in for dental emergencies. I can’t keep living this way. I finally went to the dental office and said I just want to remove my teeth and get dentures. He essentially yelled at me and told me it was the stupidest thing he’s ever heard someone my age recommend (I’m 29). I left in tears and with no idea of how to progress with my disaster of a mouth. What do I do? Would it really be so horrible? I’m very sorry you were treated this way. It’s a shame your dentist wasn’t more understanding, especially because a little compassion would have gone a long way to helping you to a useful solution. There are times you can’t help that your teeth are falling apart. Your situation sounds like one of them. Though I’m sure your teeth are in a mess and you’re completely discouraged, I’m not going to suggest you extract them and get dentures. The reason for that is by the time you’re 40, you’ll have lost most of your jawbone and will be unable to even wear your dentures any longer, leaving you a dental cripple and reduced to a liquid diet. This is known as facial collapse and is the result of wearing dentures long-term. My recommendation, aside from finding a different dentist is to have your dentist list out everything that needs to be done, in order of importance taking care to save as many teeth as possible. For the teeth that can’t be saved, I’d recommend dental implants. They’ll place a prosthetic root in your jawbone protecting you from losing those minerals. The key is a dentist that can give you a reasonable plan so you’re not just interminably working without knowing what’s the most efficient means of saving your teeth. Having a total treatment plan also makes it more affordable. I had my teeth replaced years ago with dentures. I don’t think dental implants existed back then, or at least he never mentioned them to me. They haven’t been the best thing in my life. They were ugly, looking almost wooden, but served their purpose so I put up with them. Now they’re no longer serving me well. In fact, I’m having a hard time even keeping them in. My face is kind of mashing around them. Am I too old to get dental implants? If so, what are my options? Without dental implants you risk facial collapse. Your situation is not uncommon, though remarkably unpleasant for you. I’m sorry you’re facing this right now. Life is stressful enough without trials that make even the simplest of tasks like smiling and eating challenging. What’s happening to you is known as facial collapse. It’s the result of wearing dentures for a certain period of years. Here’s what happens. When your teeth were removed, your body began reabsorbing the minerals in your jawbone to use throughout your body. It does that for the sake of efficiency, recognizing that you no longer have tooth roots so the minerals are more useful elsewhere. Of course, your body doesn’t know about the technology available and that you might still want those minerals to keep in your dentures. Your jawbone shrinks as the minerals move on to better pastures, making it impossible for you to keep in your dentures any longer. It’s also what’s causing the mashed up look around your mouth, aging your appearance, as you can see from the picture above. Your age isn’t a factor in dental implants as much as the state of your health. In order to go through the implant surgery, you’d need to be in good general health. If that’s the case, the next step would be to evaluate your bone strength both making sure you have enough bone to retain the implants and it’s strong. Without that, your implants wouldn’t be able to stay in your mouth, leading to dental implant failure. There is a solution, fortunately. Bone grafting is a great procedure and has advanced to the point where they can do it in one day, outpatient. This builds up the necessary bone in your jaw so you have enough for the implants. Because of how long you’ve been wearing your dentures, you’ll definitely need to have bone grafting done. You brought up the issue of your denture’s appearance being obviously unnatural. That’s not because they’re dentures. That’s because of the quality of your dentist and his skill level in cosmetic work. 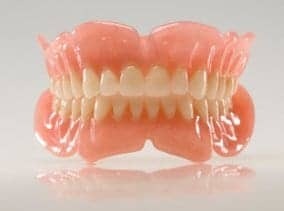 Dentures, done by an artistic cosmetic dentist can not only look natural but look absolutely stunning. It’s like getting a total smile makeover with porcelain veneers. So, in order for your smile to end up attractive, you’re going to want to be certain your dentist has expertise in both dental implants AND cosmetic dentistry. For the implants, ask them about their post-graduate training. Also ask them about their success rate. It should run about 98%. For the cosmetic end. Look on the mynewsmile.com website. They have a tool to help patients locate skilled, artistic cosmetic dentists by location. A dentist cannot purchase their way onto the site. Instead, they have to demonstrate their technical skill and show cases they’ve performed themselves showing they have the artistry necessary to give you a beautiful smile.